My last few months in Ghana were particularly difficult, but that’s another blog post. One of my guilty pleasures to get through was engaging in music photography. I miss this as in New York, at least the venues I’ve been to, it’s hard to engage in photography. First of all, you’re too far away from the stage. Secondly, images of certain events are so controlled that you’re not even allowed to take photos with certain cameras. I watched my Canon T3i being whisked away at the Roseland Ballroom because of its lens, and was given a number and told abruptly to pick it up at the end of the show. But in Accra, music/concert photography was easy. As a matter of fact, artists wanted you to take their pictures because there was no media present to cover the event. Yet, another sad story for another day about art & culture journalism in Ghana. Here is a photo I took at +233 Jazz Club on a Wednesday night. A guitarist playing from the all-woman band Della Hayes and the Women of Color Band. I lived for their shows! These are ‘market women’ who honed their skills as musicians and now play at home and internationally. I submitted this to a photo exhibition called Women and Cities (in Africa). Looking at the photo now, I don’t even think this was my best. I could’ve focused more on her hands on the guitar and given the background a nice “blur,” a skill I’m still practicing. Out of all the photos I submitted, this and one photo from Ghana Fashion Week were accepted. It also wasn’t great in my opinion. But I think they were accepted because they were different. Believe me, many of the photos were amazing and the woman photographers who submitted blew me out of the water in most cases. There were re-curring themes of women selling on the streets and women in markets. There were also photos of women in non-traditional roles like chefs, bus drivers and the like. I guess this photo, along with the other, was selected not because it was great, but because they were different. I’m still happy at the puny two photos that were accepted. 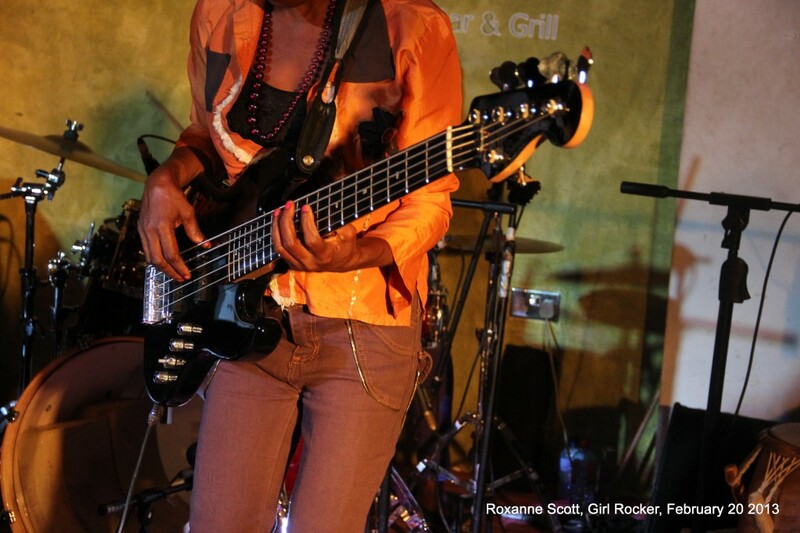 This one not only shows a woman guitarist, but a glimpse of nightlife (and music) in Accra. The other one showed glamour, as it was a model on the runway in a wedding dress. These scenes were juxtaposed with the aforementioned women on the streets selling. Lesson Learned: I guess it pays sometimes to be different.